There are so many dating apps these days. In fact, they can be overwhelming. How to choose which to use? There's a new one that claims to be "very addictive," with "ease and speed" like no other, with "no rejection factor, so you don't have to worry about rejection." Sound too good to be true? Well, yeah, but after trying the app myself, I can see where Steve Sarner, the app's VP of Marketing, is coming from (he provided these words). I'm not sure how much simpler a dating app can get. 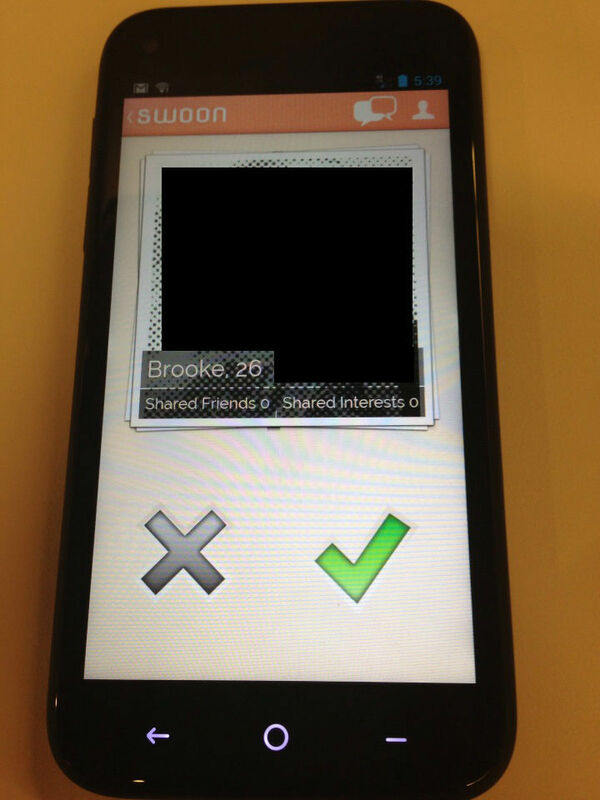 Swoon launched Android only to start, but an iOS version is expected in May. The concept behind it is so simple. You connect your Facebook account -- no questionnaires to fill out, nothing -- and you're flipping through a bunch of Facebook profile photos with first names, ages, mutual friends and mutual interests listed. You flick a card in any direction or hit an 'X' to move to the next one. In fact, you can cycle through people as quickly as you'd like (as fast as you can comprehend). If you're interested in someone, you hit a giant green checkmark. The other party is notified of interest. They can see your basic info and if they're interested too, only then will you get notified. Otherwise you'll never know ("no rejection"). If there is mutual interest, you can start chatting right within Swoon. Sound familiar? Another app, Yoke, co-founded by former Huffington Post staffers Jeff Revesz and Rob Fishman, was based on the same concept, utilizing the Facebook Social Graph and Interest Graph to play matchmaker. The New York Times profiled it a year ago. But that app lived on Facebook only, while this one is mobile, and it no longer exists. It's also quite similar to Tinder, an iOS app. You don't have to fill out a long profile to get started on Swoon, like so many other dating apps and dating sites. You connect your Facebook, and you jump right in since it knows your gender, it knows who you're interested in, it knows where you are (these are things you give the app by connecting your Facebook), and it immediately starts showing you photos of potential partners who are about the same age. Sarner says the more you use the app, the more it'll learn the kinds of people you're interested in. The app tells you how many mutual friends you have with potential matches and it'll also highlight shared interests, again which it knows since you connect Facebook. 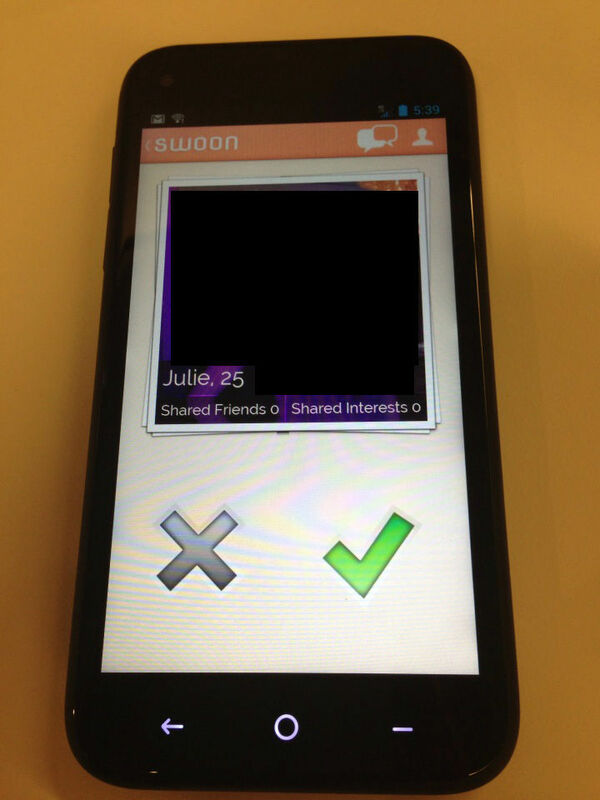 Swoon launched last month as part of a larger initiative by the social network Tagged to branch out into standalone apps. Tagged, founded in 2004, has more than 300 million members and calls itself "the social network for meeting new people."